An invasive insect could threaten salmon habitat in the Pacific Northwest. The green alder sawfly (Monosoma pulveratum) was first documented in North America in the 1990s and may have been introduced through shipping dunnage or timber from Eastern Europe. In Alaska, the sawfly larvae have a voracious appetite for thin leaf alder (Alnus tenuifolia). By late summer, entire stands of trees are nearly leafless (Figure 1). Figure 1. Sawfly larvae consume the leaves of alder trees. Credit: DA Roon. Alders are an important tree species for salmon stream ecosystems. Like other tree species that line a stream corridor, their canopy provides shade and nutrients from leaf litter. However, alder forests are unique in that they contribute more prey to salmon streams than conifer forests. Unsuspecting bugs crawl out onto the alder’s broad leaves to eat, topple into the stream, and are consumed by hungry young salmon. Can the sawfly disrupt this food web through its consumption of alder leaves? Or perhaps (in a convenient twist) are the juicy, soft bodied and abundant sawfly larvae an alternative food source for salmon? David Roon and Mark Wipfli from the University of Alaska Fairbanks and James Kruse from the USDA Forest Service teamed up to investigate the impacts of invasive sawfly in southcentral Alaska. They hypothesized that alder leaf consumption by the sawfly larvae in mid and late summer would reduce the amount of native terrestrial (i.e. land-based) bugs on three levels: 1. the alder leaves, 2. as subsidy into the stream, and 3. in juvenile coho salmon (Oncorhynchus kisutch) diets. 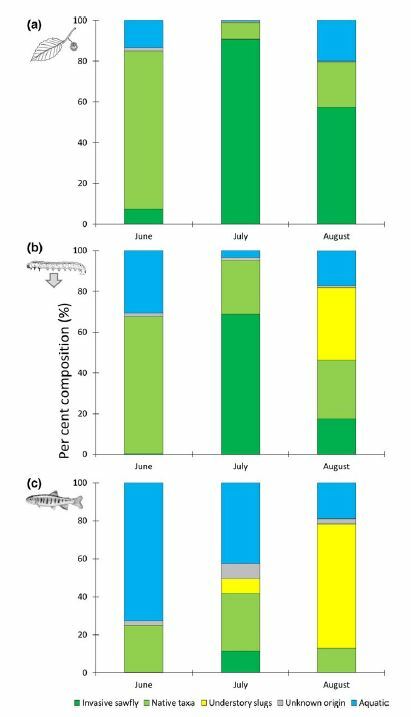 To test their hypothesis, they visited four watersheds surrounding Cook Inlet, Alaska during the early stages of an invasion (the alders had lost 13-38% of their leaves to the sawfly larvae) in early (June), mid (July), and late (August) summer. They snipped alder branches to collect bugs directly from the leaves, placed collection pans on the stream surface to catch bugs falling off leaves, and flushed the stomachs of juvenile coho to non-lethally sample their diets (Figure 2). Back in the lab they identified and weighed all of the bugs. Figure 2. Sampling techniques: floating pan traps and flushing juvenile coho salmon stomachs. Credit: DA Roon. over the course of the summer, the biomass of native terrestrial bugs remained steady in both the pan traps and the fish diets. They also found that the sawfly larvae are not on the menu for juvenile coho salmon. The diets had very low numbers of sawfly larvae, in spite of the high numbers of available sawfly larvae in the environment (Figure 3). The fish were favoring native terrestrial bugs over the sawfly larvae. The results of this study suggest that sawflies pose a limited threat to the terrestrial bugs that serve as coho prey during the early stages of an invasion. However, it is important to consider both time and scale before concluding that a sawfly invasion is harmless to salmon habitat and food webs. For example, terrestrial bug communities could be negatively impacted as the invasion progresses and trees lose a greater percentage of their leaves or succumb to other stressors such as disease. The salmon may still be impacted in a myriad of indirect pathways that were not explored in this study (such as loss of shade or nutrients from defoliation). This study provides an important benchmark of the sawfly invasion in Alaska, and serves as a reminder that protecting salmon habitat extends beyond the water. Source: Roon DA, Wipfli MS, Kruse JJ. Riparian defoliation by the invasive green alder sawfly influences terrestrial prey subsidies to salmon streams. Ecol Freshw Fish. 2018;00:1–13. The salmon dating game: Are large males more successful in finding mates and siring offspring? Next story When the shark is away… How the decline of sharks on a coral reef has led to changes in local fish.